Compact cars are great for many reasons. First of all, they can be some of the most reliable. Second, they get high gas mileage, and third, they’re cheap! The Toyota Corolla and Honda Civic are two of the best compacts on the market, but a difference in reliability could make the choice for you. Compact cars can easily be the most inexpensive options on the market - many are under $20,000. Since they tend to fall in the same ballpark, it can be hard to pick a car off of this category alone. Toyota lists the Corolla with a starting MSRP of $18,500 for the L trim. According to Honda, the MSRP of the Civic sedan starts at $18,740. An extra $240 may seem like a lot of money, but after you break it down into a 60-month car loan without taxes or interest, you’re only paying an extra $4 per month. Fuel economy is one of the top reasons people purchase a compact car. You can go further without having to shell out to fill up the tank. 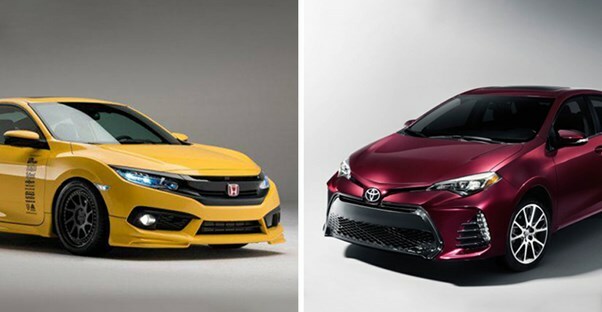 Both of these vehicles get high gas mileage, but the Honda Civic beats the Toyota Corolla by a small margin. The Honda Civic gets 28 mpg in the city and 39 mpg on the highway. Meanwhile, the Toyota Corolla gets 27 mpg in the city and 35 mpg on the highway. The reason the Corolla likely gets lower fuel economy is that it’s equipped with a 1.8-engine while the Civic has a 1.5-liter. It gives the Corolla more power, but slightly lower gas mileage. The amount of space in the vehicle can be a make-or-break issue, especially for tall drivers. Since these cars are stacked up pretty equally, more legroom could make the decision incredibly simple. Reviews indicate that both of these vehicles are relatively roomy, but Edmund’s states that the Corolla has more legroom than your average small sedan. This could be because the Corolla sacrificed trunk space at 13 cubic feet while the Civic still manages 15.1 cubic feet of room in the trunk. Depending on your priorities, this can make the decision pretty easy. Both Honda and Toyota have a record of producing reliable vehicles, but one surely has to be better than the other right? Unfortunately, because these vehicles are so new, we’ll have to look at the 2016 models. Both cars have been around for generations, so it’s a pretty fair comparison. According to J.D. Power Associates, the Toyota Corolla is the best for reliability. It has received a whopping five out of five reliability score from both groups, something few cars manage to do. It’s among the best for reliability. The Honda Civic received only 2 stars for reliability from J.D. Power. This definitely puts it a tier or two below the Corolla.